Trigeminal neuralgia is a condition in which the trigeminal nerve, a nerve that goes from the brain to the face, is affected. In most cases, the nerve is pinched or compressed and causes a shooting facial pain, or even unexplainable sensations in the face in some patients. It often affects only one side of the face and can affect one, two, or all three divisions of the trigeminal nerve, meaning it can affect different parts of the face. Patients report that brushing their teeth or taking a shower causes excruciating facial pain. Some of the patients report that even cold wind can cause extreme facial pain. It is often found that patients are afraid to touch their faces and even everyday actions as important as eating or drinking can be painful. The majority of patients also report depression and anxiety from their chronic battles with pain. Trigeminal neuralgia is usually diagnosed based on symptoms, a neurological exam including touching and examining the patient's face, and an MRI to rule out if multiple sclerosis or tumors are the cause. Research studies show that the incidence of trigeminal neuralgia is between 4 and 27 per 100,000 people annually, with the prevalence going up after age 50. They have also oberved that females are more affected than males. Medical treatments are medication, injections, and/or surgery; however, acupuncture has been shown to be an effective treatment of trigeminal neuralgia. 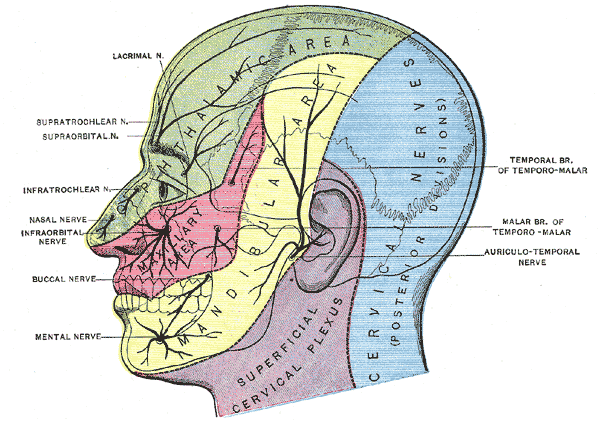 In cases of trigeminal neuralgia, acupuncture induces the analgesic effect by stimulating the central nervous system and thus resulting in activation of the various opioid receptors in the brain, which produce overall analgesic effects, just the way acupuncture would work for any kind of the pain in the body. In one trigeminal neuralgia study, the patient was a 66-year-old female that presented to the acupuncture clinic with chronic left-sided facial pain for 25 years. Her pain was triggered by speaking, eating, or touching the area. Pain level was 10/10 on VAS with 0 being no pain and 10 being worst pain ever. Throughout the years she was treated with conventional medicine unsuccessfully with multiple therapeutic methods such as medications, injections and surgery. In an acupuncture clinic, the patient was treated with acupuncture 3 times a week for 45 minutes per session. After the fourth session, she reported almost no pain, by the sixth week, or 14 sessions, she was completely pain-free and was pain-free by the end of a 6 month follow-up. The acupuncture treatment included local points SJ17, SJ21, Gb2, SI18, St2, St3, St7, Du26, and LI20, and systemic points SJ5, LI4, St36, St44, St45 and Liv3. This next case was a patient of mine at the Yin Yang House clinic. My patient was a 63-year-old female that came in with the entire right side of her face hurting for one week. When moving the right lip she felt an electric shock sensation on the right side of her face and her lip. She fell a year ago and hit the right side of her face. She has had to drink water with a straw and is stressed a lot. The acupuncture points used were local points SI19, St3, St4, LI20, St6, Gb1, Ub2 and distal points LI4, Liv3, Sp6, Ht7, Gb13, Du24, Du20. She was seen twice during her first week of treatment and then once a week for 5 weeks, 7 treatments in total. After the 3rd treatment, she reported a significant relief, to the point where she would have only two “nerve zings” a day (down from 30/day). On her sixth visit she reported that the pain in her mouth area went away, she had some dull discomfort left in the right side of her nose and temple area. Overall she felt a lot better with more energy and better sleep. On the seventh visit, she reported no pain for the last 3 days. As we can see from the above cases, acupuncture can be a successful method of decreasing or even eliminating the pain caused by a trigeminal neuralgia. However, it may take a few treatments to achieve complete relief. Patients need to be made aware of this, thus proper patient education is a must before patients consider quitting treatment and saying that acupuncture "didn't help". In today's society we are eager to do everything fast, even heal fast, but sometimes that is just not the case and we need to understand that healing is not an event, but a process that may take time to fully recover.